Yep, I’ve been quiet. Very quiet recently! In truth, it’s been a really busy time, so I thought I’d take this opportunity at the beginning of the New Year to tell you what’s been happening and peek behind the curtain a little more of my life so you can understand why articles have been rare of late (however, will be more regular very soon). Consultancy - I’ve recently taken out a three month Project Management consultancy contract, which is a pretty much full time role given the scope of the Project that is being managed. This is great, giving me a real chance to showcase some of the Productivity tips and techniques I of course advocate. It’s a good project, managing the upgrade of a local council’s network infrastructure with lots of challenges therein. Training - I’m delivering Productivity workshops with Think Productive in the UK and this is amazing stuff. It doesn’t feel like work at all and I can finally say that standing up in a room/meeting space or even on a stage finally feels natural. It’s tiring though - there is a lot more work both pre/post workshop than I realised and I underestimated the physical effects that all-day workshops can have. On the train home I sometimes feel like I could sleep for a week! Writing/Video Production - As some of you know, I write for several third parties and have now started creating videos/screencasts as well. Again, this doesn’t feel ‘worky’ at all as it’s something I love and have a deep passion for. That’s a lot of hours taken up in the week. The goal for 2019 is to slowly take away the reliance on the consultancy and develop MyProductiveMac into more of a brand, with my own products released regularly, enabling more of a passive income stream than I currently have. This means that there are some serious decisions to make in 2019 regarding where my hours are spent and calendar management is going to need to be at its most efficient. I’m going to be making frequent use of time-blocking to ensure that I’m spending my hours as frugally as I spend my money. It’s going to be hard work, I’m under no illusion of that but with the support of family/friends/colleagues and my loyal readers, I know it’s going to be a great year. If you use DEVONthink on your Mac and have recently updated to Mojave, you may have noticed a disconnect between the application and Mail. This is down to the new security features that have been implemented in Mojave and requires just a little intervention on your part to remedy. It’s quick and easy. 1 - Go to System Preferences -> Security and Privacy and enable full disk access for DEVONthink. In this years WWDC, Apple announced app autofill - an API that will allow credentials to be filled in to applications in the same way as they are in websites - pretty sweet. Recently, the team at 1Password released version 7.2 of their 1Password application and this leverages the API beautifully. Once AutoFill Passwords is enabled for both iCloud Keychain and 1Password, it doesn’t matter where the password is stored, you can fill it in directly from the interface you are using which as many of you will know, is a real time-saver. To enable the feature, you must be using iOS 12. Once you are running it, simply head to Settings -> Passwords and Accounts. Flick the toggle switch to enable AutoFill Passwords and then select the applications that you wish to enable the feature for. As you can see, as well as iCloud Keychain, I’ve enabled it for 1Password too. Now in the screenshot below, I’m attempting to log back into the Amazon application. It’s already suggesting the 1Password credentials that I have. 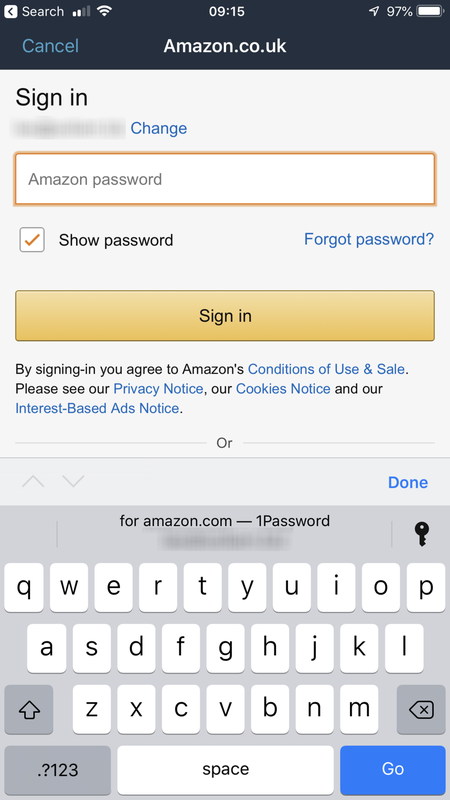 If I press the key to the right of the password suggestion, it will list all credentials for Amazon that are listed in both iCloud Keychain and 1Password. This is great and, even if you don’t use 1Password and rely on iCloud Keychain, it really leaves no excuse for using the same, weak passwords on multiple sites. Get secure people! There are so many reasons behind my decision to stay with OmniFocus as my second brain tool, it would take far too long for you to read them all here. I would, however like to write about one of the main features that is all too easy to ignore when you are looking at developing your productivity workflow - and that is the Review. Reviewing is, for me, the cornerstone of my workflow. My Weekly Review is the one meeting in the week that is never cancelled. Without it, I lose trust in my system and as soon as that starts to go, then everything starts to unravel. I start wondering whether the action I’m working on now is actually what I should be doing, I start thinking about other unfinished projects and actions that need to be taken on them - my focus disappears and my results drop. My review is that important to me and thankfully, OmniFocus makes it easy to carry it out. A Review can happen at a given frequency (daily, weekly, monthly, quarterly, annually) and consists of a list of checks you carry out to make sure your ship is still heading in the right direction, allowing you to course correct if needed. At the bare minimum, a weekly review is recommended and that’s what I’m going to discuss here, however as you read, you’ll think of ideas that you can implement for other reviews as well - especially a daily one as you close down for the day. Ideally, you should be using your Weekly Review to gather all of your inputs. These can be emails, phone messages, physical notes, calendar entries - anything that hasn’t been formally processed needs to be either added into OmniFocus, or deleted as appropriate. This is one time when I actually ignore the 2 minute rule (for those of you who don’t know this - if a task will take two minutes or less, then do it there and then). The reason I ignore it is that I have 90 minutes maximum to complete my Review. If I spend 30 of those minutes completing 15 tasks, I will not complete my Review and that is not an option. Instead, if it looks like I have lots of quick wins available, I schedule a thirty minute window to complete them in my calendar. Once the inputs are processed, review your outlook. Check your calendar for the next four-six weeks to make sure that any arrangements you need to make are added to OmniFocus. Review your projects and be sure they all have a Next Action assigned to them. I also use this opportunity to block out periods of time in the coming week(s) for core tasks. My writing time is scheduled, my development time is scheduled, with enough white space to move things around if needed. The ability to review a project is where OmniFocus shines for me. On the sidebar, there is a Review button which offers a visual indicator as to whether any projects needs reviewing. If there is a purple line to the left of the button, then you need to take some action. Clicking this button opens up a perspective called Review and lists all of the projects that are awaiting a review. The presence of these projects is dictated by the metadata of the project. If you click the Inspector, you’ll see a Review section that allows you to configure the due date of the next review as well as the frequency. If it’s a project that isn’t key at the moment and doesn’t need to be reviewed that often, change it to two/three weeks, perhaps a month. I’ve some long-standing projects that aren’t going to be reviewed for another three months, because they just aren’t a priority for me at the moment. The list of projects will appear on the left hand pane and as you click on each project, you’ll see a Mark Reviewed button appear in the perspective header. Click this and the due date for the next review will change dependant on the metadata settings described earlier. You can also mark a project reviewed from other perspectives too. Customise the Toolbar to add the Review icon (it’s a coffee cup with a tick above) and every time you open a Project in OmniFocus, you can Review it as you go. I cannot impress on you enough the importance of reviewing your systems and projects. This gives you confidence that you are doing the right thing at the right time and frees up your brain to create magic. Over the last few months, I’ve actually been trying hard to make use of some of the stock apps on iOS. There are several reasons for this, however one of the main reasons has been to have a quicker interface with the core OS between devices. An example of this comes with the Calendar application. Don’t get me wrong, I love Fantastical on both iPad and iPhone, however there would be times when I’d add an event on one device and it wouldn’t show up on another for a period of time. Not always - just sometimes, whereas this isn’t something I’ve ever experienced with the native application. My calendar needs to be spot on, so I moved. To that end, I thought I’d give the native Podcasts application a spin so that I can sync between my iMac and iPhone, alternating which device I use to listen dependant on my circumstance. Also, using Siri to launch a podcast, or playlist, is really handy. The Apple Podcasts application is certainly better than it was, however there are features with Overcast that I definitely miss. Smart Speed helps cut out those annoying pauses that you get within the dialog and Voice Boost is great when you are listening on the iPhones built-in speaker rather than headphones. The layout of the application is beautiful, with great attention to detail that the developer, Marco Arment, is renowned for. 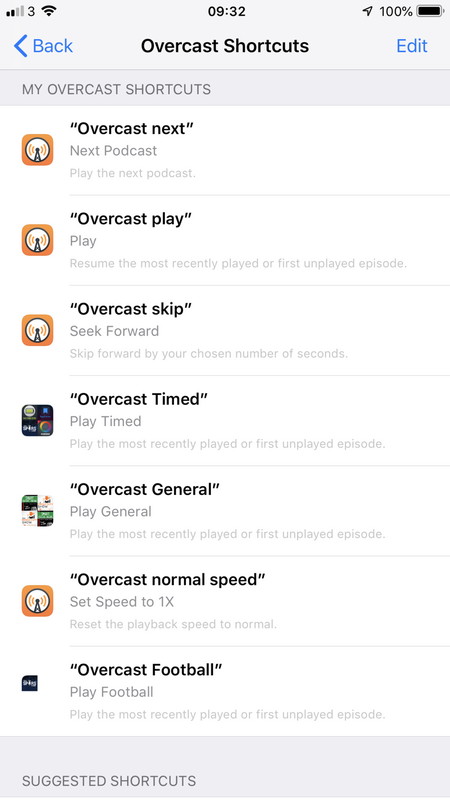 Now, we have Siri Shortcuts added to the mix and I’m totally back on the Overcast bandwagon. I’ve only just started playing with it and I’m certainly not leveraging it to it’s full potential, however I’m definitely saving time when it comes to how I access my favourite podcasts. Overcast Football, Overcast Timed and Overcast General will play the current podcast in the respective playlist. It’s a small difference, however when driving, it’s massive. When laying on the sofa with AirPods in and my iPhone on charge at the other end of the room, it’s massive. I’ve elected to go with the name of the application first, as I know I’m going to be embracing the Siri Shortcuts functionality in every application I own that supports it, so I don’t want to ever have any confusion in what the shortcut phrase actually is! I’ve named a couple of specific podcasts as well - Overcast Mac Power Users is used quite often, along with Overcast The Mac Show (love those British Tech Network chaps!). Setting the speed is available as a shortcut too. I listen to most of mine at 1.6x however when Merlin Mann is going off on one, I need to reduce the speed a lot as it can sound four times faster than normal! Overcast Speed 1x is my go-to in that scenario. You can seek forward/back by a chosen number of seconds, skip chapters and even start your sleep timer, all from Siri. It’s a great update to a wonderful application and well recommended.